(Newser) – On Tuesday, in the wake of the Orlando shooting, President Obama launched a "blistering verbal assault" on Donald Trump, according to CNN. And Paul Waldman at the Washington Post says Obama "ripped into Donald Trump's nightmare vision of America" with "his most detailed and comprehensive attack" yet. In his speech, Obama took major issue with Trump's call to ban Muslim immigrants and his demand that Obama use the phrase "radical Islamic terrorism," the New York Times reports. According to CNBC, Obama says attitudes like that "make it a lot easier to radicalize people here and around the world" and go against “the very values America stands for.” Obama calls it a "dangerous mindset." 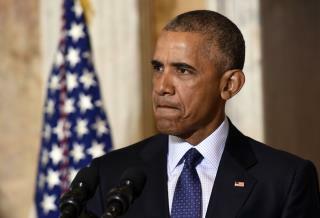 The one thing that I can't ever forgive Obama for is saying that all the Islamist terrorism is because Trump wasn't polite enough to the Muslims and angered them so they had this reasonable reaction and went to recruit in the ISIS and bring back this Islamic army to murder us Americans! If that is truly the case, then will you kindly kill Trump and bring peace to the world! Most of what Obozo said would be good advice if he would just follow it himself. Too bad he's unwilling to go after the terrorists the way he's willing to go after The Donald. He's not bright enough to realize that the terrorists' bombs and bullets are a lot more dangerous that anybody's words.